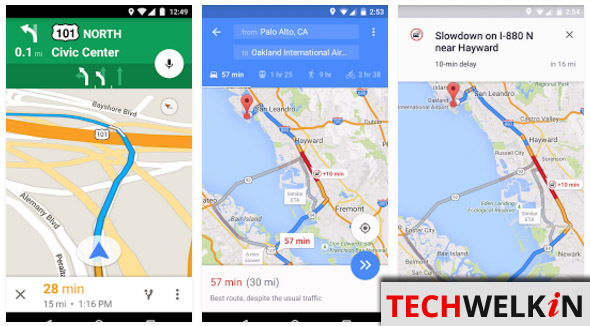 Ever wondered how does Google shows the traffic updates in your mobile phone? Learn about the cool trick of how Google Maps track traffic on roads. Whenever I plan to go out, I often check Google Maps to get the directions from my current location to the destination. Google Maps is an excellent and reliable tool for travelers and drivers. You can easily download Google Maps in your mobile phone and use it to get Google Maps traffic updates. One of the most useful features of this app is that they show the amount of traffic present on various routes in a city. Google shows you if the traffic is moving along well or there are traffic jams at certain roads. This information is helpful for drivers as they can avoid roads where there is traffic congestion. The other day, I was traveling with a friend of mine. I opened Google Maps and checked the traffic situation on the road that lay ahead. On seeing this my friend asked me how does Google Maps know about the traffic conditions? Do they use satellite imagery for this feature? I am sure, like my friend, many of you have also asked yourself this question. And many of you must have credited satellite imagery for this cool feature. But this assumption is wrong! I know that Google is a massive company, but they don’t have their helicopters hovering everywhere in the world to collect real-time traffic data! So, then how does Google show traffic updates? Let’s explore the answer to this question! In the short, the answer is that Google uses your Android smartphone to collect information about traffic status. Android, as know you, is a Google product. They don’t look at how many cars are traveling on a road —instead, what Google gets to know is how many Android phones are going along a particular path. Have you ever wondered how Google knows about the traffic status on roads? As you travel on a road, your Android smartphone keeps on transmitting its location back to Google. From this information, Google calculates the speed at which you’re traveling and from the speed of all the Android phones on that road, Google figures out whether the traffic is smooth or snarling. But what if there is not a even single Android user is traveling on a road? Well, in that case Google shows that road with grey or white color; indicating that it does not know the traffic status of that stretch. However, given the popularity of Android-based smartphones, it is often possible for Google to show correct real-time traffic situation in big cities around the world. By the way, non-Android devices that use Google Maps app can also transmit location data to Google. How is the Traffic Data Shown in Google Maps? 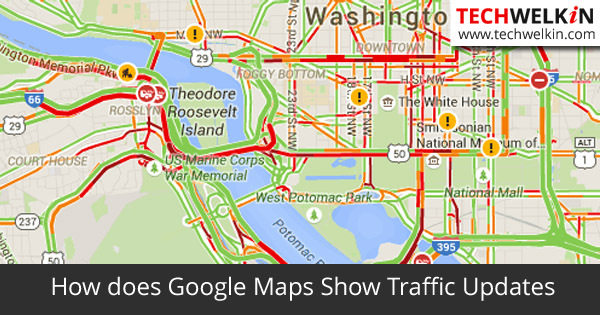 So, now we know that Google crowd-source the traffic data for its Maps tool. Dave Barth explained the entire process in an official blog post. Dave says that Google does not get to know the identity of the vehicle in which the phone is traveling nor do they get any information about the people inside the vehicle. To further protect the privacy, Google deletes a few minutes of data from the start and end of a trip. As a result, Google does not know the origin or destination of your trip. Google Maps app for mobile devices. Google also has algorithms that can exclude anomalies like a postman stopping more often on a route to deliver letters. These algorithms will find out and exclude the such cases. Thus a frequently stopping postman will not trigger a traffic congestion alarm in Google Maps. Once Google gets enough data to make an opinion about the traffic situation on a road, it begins painting. If the traffic is going smooth on a road, Google Maps paint the road with green color. Slow traffic is marked with yellow color and traffic jams are indicated by red color. Severe traffic jams are indicated by deep red (maroon) color. When Google does not have enough data about traffic conditions on a road, it offers you to show the typical traffic on that location at that particular time. This tells us that Google saves the traffic conditions on roads in its database and use this information as a learning tool. Yes, there is a privacy concern involved in this approach of data gathering. But then, in today’s highly digitized world do we really think that the Big Brother doesn’t know anything about us?! Google knows a lot about us. We can only trust Google’s explanation that they keep and use only anonymous data to indicate traffic. Nevertheless, Google has provided an option to opt-out and not share your location related data with Google. On this the company says “Once you disable or opt out of My Location, Maps will not continue to send radio information back to Google servers to determine your handset’s approximate location”. So, this is the secret behind the mind-boggling traffic update feature of the Google Maps. I hope you like this article. Please feel free to share your viewpoint on this topic. Have you opted-out of sharing your location related data? Do let us know in the comments section. Thank you for using TechWelkin! I have a Galaxy 7, with a Maps Version 10.13.3. I use Maps in New York City. Sometimes, Maps provide traffic information; sometimes, does not–and as I am driving, cannot go and search for the options sequence to show traffic. Which by the way, is difficult to find. Would anybody know a page to access Help for the often updating current-Google-Maps-Version, specifically to show Traffic? This is good info, liked it. 2.How Google get to know about any accident on the road or incident? Can google map tell you the concentration (number of cell Phones)? Is there a way to work backward (when or limit of Andriod users before it paint)? Google Maps will also display when a collision has been reported via the Waze app, so there’s some interconnectivity between the two in that instance. In addition, road construction and closures are also displayed, so they must be probing municipal services for that information. Yes, Tim, Google must be collaborating with other services to gather information. Google is amazing!